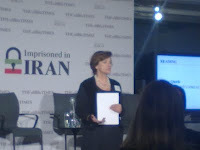 I thought the Times seminar last night, held in support of the prisoners of conscience in Iran, was an excellent event to raise awareness for Iran's political prisoners. The highlight of the evening for me was when British actress, Diana Quick, read Nasrin Sotoudeh's letter to her three year old son, Nima, which really stirred the emotions amongst the attendees at the Times seminar. Iranian born comedian, Omid Djalili, did an excellent job of both making the audience laugh but also highlight the brutalities of the regime in Iran and the discriminations against Iran's minorities. Fazel Hawramy, an Iranian Kurdish activist, also raised a very good point during the event. The vasts amounts of money, the Law Enforcement Forces in the Islamic Republic of Iran receive from UK and the EU, supposedly for fighting narcotics. Something to ponder about.